Pairs Head – Alex & Lola won WJ18 2-, Glyn & Neil won Mens MasE 2-, Crispin & Jan came 19th overall, Sam & James came 23rd overall (Lightweight category), Rowan & Matt came 28th overall (in a pair!). Weybridge Silver Sculls – Well, we pretty much won everything! Here are all the 1st places, we also had 7 2nd places and 6 3rd places! Fours Head – No wins, but the Senior quad came 2nd in category until we got disqualified for forgetting to change a substitute on the online entry system. Veteran Fours Head – No wins, but two 2nd places in Mas E and F with crews of Richard Adey, Glyn Groom, Mike Bishop, Neil West and Mike Everington, Richard Thiemann, Dave Clarke, Roger Wotton. Kingston Small Boats Head – Two wins, Mike Everington & Richard Thiemann in Masters E pairs and a Masters E-F coxless quad of Nick Harris, Vince Gillespie, Ian Tarrant and Mike Hamblin. Hampton Small Boats Head – A massive entry from the Junior department. With two wins and four second places. Toby & Gianluca won J17 pairs, Rowan & Pat won J17 pairs. With also some very close and tough racing in junior singles by Matt Heywood and Katherine Stenning. Scullers Head and our own Walton Small Boats head were cancelled due to poor conditions. Weybridge Winter Head – We picked up 5 wins out of 8 entries! The Mens Senior 8 of Dave Slattery, Jamie Pine, Nick George, Me, Crispin Knill, Bryn Hassan, James McMullan (sub), James Pickering and Millie Davis cox, won open eights. The J14 octuple won their category with a crew of Toby Keary, Harry Springett, Alex Richardson, Henry Zeghibe, Ciaran Rushworth, Cyrus Hakim-Rad, Toby Dachtler, Filippo De Marsanich. The Masters D E F H 4x- won with a crew of Mike Everington, Dave Clarke, Terry Martin and Richard Thiemann. In the Masters B C D category, Ali Jackson and Steve Heywoon won and in the Womens Masters E F coxless quads there was a win for a crew of Fiona McAnena, Carol Cornell, Jo Wilkinson and Jane Alsop. Great work! Molesey Vets Head – Two second places for Womens Masters B/C and Mens Masters E/F eights. Hammersmith Head – With only one entry, Walton still managed to win in Open Development Eights in the Senior mens crew of Dave Slattery, Jamie Pine, Nick George, Me, Crispin Knill, Bryn Hassan, Oscar Roberts (sub), James Pickering and Millie Davis cox. Reading University Head – The Senior Eight in full, with a crew of Dave Slattery, Jamie Pine, Nick George, Me, Crispin Knill, Bryn Hassan, Jan Swedlow, James Pickering and Millie Davis cox, managed second in category. The Schools Head and Womens head reduced their intake of crews due to the forecast poor conditions which sadly didn’t include any Walton crews. Junior Sculling Head – All crews rowed very well in the conditions which turn around to be the complete opposite half way through the race… a silver medal was won by the J17 4x- of Patrick, James, Aidan and Harry. A number of solid results including a fourth place from the J18 quad (Rowan, Olli, Matt and James), eighth in the WJ17 quad (Millie, Hannah, Lola and Tallulah) and fifth for the J16 quad (Gianluca, Toby, Archie and Christian). Our younger juniors were also out in force – the boys J14 Octo, with a crew of Bastie Schioldan, Toby Keary, Harry Springett, Ciaran Rushworth, Cyrus Hakim-Rad, Toby Dachtler, Julius Staadecker, Henry Zeghibe, coxed by Isabella Smith, and girls J14 quad of Luella Davis, Katie Leigh, Manasa Arun, Ruby Casey, coxed by Ethan Joslin, both raced very well in their first national-level event and were well up in the field. A number of crews to keep an eye on over the summer. 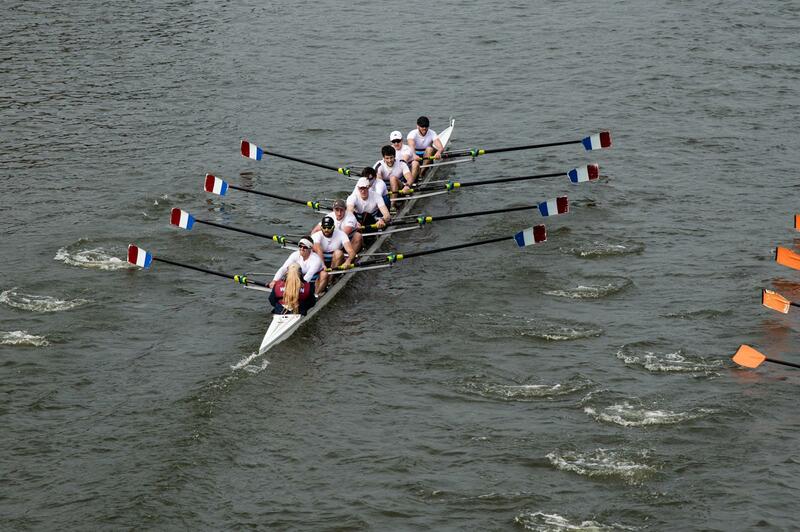 Kingston Head – 5 wins out of 8 entries! Mens Masters F crew of Roger Wotton, Duncan Graham, Terry Martin, Mike Everington, Richard Adey, Dave Clarke, Andy Tomalin, Glyn Groom, coxed by John Pearce, Won! Mens J18 4x- crew of Pat Cleary, Rowan O’Neill, Matt Heywood and Henry Punter, Won! A mens J16 4+ crew of Christian Schioldan, Archie Goldfinch, Gianluca Maffi, Toby Rackett, coxed by Millie Davis, Won! A Womens Junior 18 coxed four with a crew of Amy Donaldson, Katherine Stenning, Millie Fantham, Alex Poole, coxed by Eva Roberts, Won! Some of the previous crew then went on to win again in the second division on a quad with Tallulah Thomas! And a second place in the Womens J16 coxless quads with a crew of Elysia Rushworth, Charlotte Drew, Isy Grimshaw and Heeva Paiman. Cracking results. Head of The River – The Junior eight, with a crew of Rowan O’Neill, Aidan McLennan, Oli Brew, Oscar Roberts, Pat Cleary, Matt Heywood, James McMullan, Henry Punter, coxed by Maddy Jackson, did incredibly well to finish in 79th place. The senior eight, with a crew of Dave Slattery, James Pickering, Nick George, Me, Jan Swedlow, Ben Chrichard, Crispin Knill, Jamie Pine, coxed by Millie Davis, had a disappointing row despite overtaking 5 crews finished 116th, mainly due to a low starting number having to row on the slowing tide. The junior and senior eights were very close in speed, the junior eight often beating the senior eight by 5 seconds or so in training pieces. Vets Head of The River – A great win for the Mixed Masters D-F eight with a crew of Gill Shaw, Emily Kean, Adrienne Burke, Matt Graywood, Andy Tomalin, Pete Knight, Stephen Heywood and Ali Jackson. 12th place overall for the Walton/Team Keane composite with Walton supplying Crispin Knill, Nick George and Myself for the Masters A eight. The Mens Masters F came second with a crew of Roger Wotton, Mike Everington, Terry Martin, Richard Adey, Dave Clarke, Duncan Graham, Sal Hassan, Glyn Groom, coxed by John Pearce. The Womens Masters D crew came a respectable 5th in category with a crew of Hilary Poole, Hazel Thiemann, Lesley Flowerdew, Carol Cornell, Jo Wilkinson, Tracy Axten, Fiona McAnena and Zoe Guiniven. Well done to everyone. Sorry if I have missed anyone out of got some of it wrong. A real great stack of results, looking forward to seeing these crews progress through the summer. A race schedule will be produced in the next couple of weeks. Good luck. In the meantime, whatever you do, don’t take up fishing.